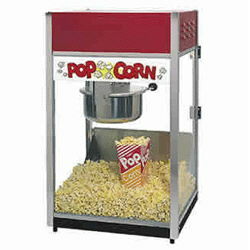 The Gold Medal Deluxe Sixty Popper Popcorn Machine with Cart is the show piece of all 6 oz. deluxe machines and features antique styling, etched glass, cast filigree, brass-like antique finish and 6oz. kettle popper. How much popcorn packages do you need? So 9 should give you a ball park amount of packages you would need. * Please call us for any questions on our popcorn machine rentals in New Britain PA, serving the Greater Philadelphia area.